The name Christopher Irving is pretty familiar to readers of comics journalism. From the amazing site, GraphicNYC with Seth Kusher to got his work in such comics periodicals including Comics Buyer’s Guide, Comic Book Artist (where he served as Associate Editor), Back Issue, and Alter Ego. Irving is also a published author including the books The Blue Beetle: His Many Lives from 1939 to Today, Comics Introspective: Peter Bagge, and the upcoming Leaping Tall Buildings. 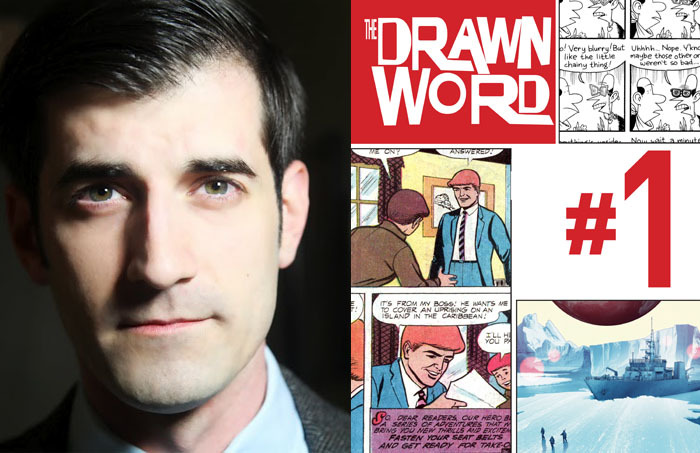 Today, Irving launches his newest project, the digital magazine The Drawn Word, which is available through Graphicly. This 136 page first issue is available for only a dollar! FOG! chatted with Irving about the project, the state of comics journalism and more after the jump. What was the genesis of The Drawn Word? Honestly, Graphic NYC was a great and fun experience, but three years of it left me pretty worn out. Seth and I created this massive and impressive collection of photos (all him!) and interview essays (all me!) that really helped elevate the presentation of comics history and personalities. The book version, Leaping Tall Buildings, is the culmination of that long stretch of work and a beautiful postscript to our successful collaboration. I just got the advance copy last week, and am still in shock at what we accomplished through a lot of hard work. But it was a LOT of work: several dozen interviews done (mostly) in person, all over NYC. So, with that done, I decided it was time to get back to my first love: the comics magazine, and to recreate the level of prestige that used to come with writing for Comics Buyer’s Guide and Comic Book Artist. In short, I wanted to create a slick new comics periodical that not only gave me a chance to work with the best writers on comics, but to also create a mag that would hopefully become the place the pros wanted to become a part of—and also took full advantage of the new tablet readers like the Nook and Kindle Fire. You’ve been involved in various forms of comics journalism for several years and have witnessed much of it’s evolution firsthand. Comics Journal has become an annual, Comic Buyer’s Guide went from weekly to monthly, Wizard has folded completely and Comic Foundry sadly had a very limited run. Is there a place for comics journalism in print and how do you compete with the immediacy of online reporting? You know, someone told me a year ago that they thought comics journalism was a joke. Much as I wanted to clock them for saying it, I couldn’t fully argue with it. There are some amazing journalists out there (re: The Beat and TCJ.com), but most of that field has been taken over by bloggers wanting to write fluff pieces to get a job in comics, or people hoping to get notice through online vitriol. I do believe that comics journalism has a place, but that in order for it to gain the level of authority it had back in the ‘80s and ‘90s, it’s going to take more commitment from editors and writers, as well as a stern maintenance of a highly-raised level of quality. That’s what I’m hoping DW will be. But, yeah, you hit the nail on the head when you said that I’ve seen the evolution: When I was twelve in 1989, my Dad bought me a subscription to Comics Buyer’s Guide, back when it was the only source for comics news. CBG was also the place for insider info from the professionals, and also where the pros might’ve duked it out and settled their differences (such as the Peter David/Todd McFarlane debate). I’d unfold that newsprint paper on my bedroom floor every Thursday when it came in, and call my best pal Marshall to tell him the comics news. After a couple years as a blogger, I actually cut my teeth at CBG in ’99, writing cover stories and a few smaller pieces for them. As much as I hated to admit it, I could then see the writing on the wall—that CBG was losing its viability as a news source because of the Internet, and I don’t think they ever fully recovered from it. Hopping on to Comic Book Artist as an Associate Editor also taught me the importance of research and reinforced my investigative journalism skills. Jon Cooke taught me everything I needed to know, how to cover all my bases and present different perspectives on a subject, and also how to raise the bar as a writer. But as we all know, CBA folded a few years back and (to me) has left a huge void in its wake. Since then, the only print magazines that are really out there are the ones from TwoMorrows which, as much as I admire and respect the editor friends I have there, are still very much fan magazines mostly geared to the initiated. I think I can safely say that they’re still around because they hit at the right time, have a loyal fanbase, and that John Morrow and his editors have done a marvelous job cultivating that fanbase and keeping their established readers, but I don’t see too many new readers to comics hopping on board. But I honestly don’t think that comics journalism can survive in print as it has been: the limited direct market (as well as the collapsing magazine market) just doesn’t support it with the amount of overhead required for printing, shipping, and storage. That’s exactly why I’m going digital with this, along with a feasible print on demand model via Amazon for those who actually want a print copy rather than just a digital. So, in short, the digital option will be dirt-cheap: $1 for 136 pages for the first issue for the first week of its release. After that, it’ll go up to $2 until the second issue comes out this summer, at which point it’ll be back down to a buck. The black and white print version will only be about six bucks, while the color print version comes as a $20 trade paperback. Whenever I get around to doing shows, I’ll have black and white copies on hand. This way, I can keep it affordable for both myself to produce and (most importantly) for readers, no matter their preference for print or digital. From an editorial standpoint, though, I want to recreate that great insider feeling that CBG used to have, while still sticking to a non-clubhouse mentality, where new comics readers can feel comfortable reading the features and original comics between my virtual covers. This first issue features Brian Wood, Kelly Sue DeConnick, Jon Kerschbaum, Bill Sienkiewicz, Jamal Igle, Bill Alger, and a few other surprises—a pretty diverse cross-section of talent that reflects how comic books are more than just the superhero set. For the second part of your question: I’m not trying to compete with online comics news blogs, but am instead embracing the same vein of thoughtful comics-writing that I honed at Graphic NYC. If anything, Drawn Word is more akin to a journal about comics (a la Comic Book Artist or Comics Journal) than a comics news magazine. You’re publishing the magazine through Graphicly. What are the challenges of designing a periodical that is both text heavy and can be seen on a variety of digital devices? I actually designed Drawn Word for the Kindle Fire and, with a little experimentation, found the perfect font size that’s not too small on the Kindle, but also not too large on the iPad. I felt there were less challenges designing, since I laid it out a page at a time, rather than having to worry about designing for a spread. It also gave me a lot more freedom to shuffle the sections around. And, honestly, after four years of figuring out how to cheat Blogger to look more website-y and less blog-y, I’m grateful to have InDesign and the design freedom it offers for Drawn Word. What is the frequency of Drawn Word and how will you utilize the website in conjunction with the magazine? For now, Drawn Word is a quarterly, which gives me time to not only test out the digital distribution, but also to fine-tune each issue. I’ll see how the first year works out and, if sales are good and readers are clamoring for more, will most definitely look at doing it more frequently. But for now, I’m enjoying working with this new group of collaborators and making the magazine I think the industry has been missing for a while. Honestly, the website is more to have a general web presence for the magazine, and not to serve as a blog. That’s not to say that I won’t ever have any form of blog up there, but that right now I’d rather focus my energies on getting the magazine off the ground and letting the work speak for itself that way. I have something pretty big that’ll be launching online by the end of the month (sorry, pretty hush-hush, but you’ll know it when you see it). I’m also hard at work on finishing my Thesis for my Master’s degree, and am moderating an academic panel at Columbia this month. Chris Claremont just donated all of his papers, and they’re celebrating with an academic conference. I was fortunate enough to be asked to moderate the panel on New York City, and it includes none other than both John Romita Sr. and Jr! Also, Seth and I have something big cooking for the release of Leaping Tall Buildings. More info on that is coming. Back to Drawn Word, #2 will be my Summer Fun issue, with a few great spotlight essays and some original comics lining up as I speak, while #3 comes out in October—and I’ll leave it to you to figure out the rather obvious theme. Expect to see me writing and editing a few original comics in the next year, as well, and plan on finding them via Drawn Word. While I was at Hermes Press, I got a collection of Gray Morrow’s lost masterpiece Orion (from the pages of Heavy Metal) off the ground, compiled by scans of his original hand colored art. The folks at HP have also included his ‘80s mini-series Edge of Chaos. I contributed a biographical essay on Gray, and all proceeds benefit his widow Pocho (who’s my favorite crazy Aunt in the mountains I never had), so please, please snag a copy to experience the magic of Gray’s work and to help out an awesome lady. I did an introductory essay to Hermes Press’ first volume of The Phantom Charlton comics (out now), and also have an essay in Steven Brower’s compilation of Golden Age Western Comics, coming from powerhouse Books at the same time as Leaping Tall Buildings. My girlfriend and I are absolutely loving the game-changing new season of the BBC Being Human (the real one, not the American); and, of course, we’re retro-minded and dying to see the new season of Mad Men in a few weeks. I just finished watching my Captain Power boxed set, and was very happy that it holds up way better than I even remember it from 1987 (and I hope, beyond hope, that they bring Power back in some form soon); the Dino Stamatopoulos stop-motion show Frankenhole; and also Alcatraz. And Transformers Prime on The Hub is, quite possibly, the best TF cartoon to ever hit the airwaves. Speaking of Transformers, I’m really loving Autocracy, the digital comic series that IDW is putting out, co-written by one of my personal and creative heroes—Flint Dille. For comics, Larry Hama’s G.I. Joe: A Real American Hero still shows us how to do a gripping single issue each month, Waid’s Daredevil has me back in love with the character (as does Slott’s Amazing Spider-Man with ol’ Webhead), and I’m still liking a handful of the new 52 comics, particularly Wonder Woman, The Flash and Swamp Thing. Biggest of all, though, are my two nieces and my nephew down in Virginia, who I’m hoping inherit the Irving pop culture gene that started with my late father and is alive and well in me.